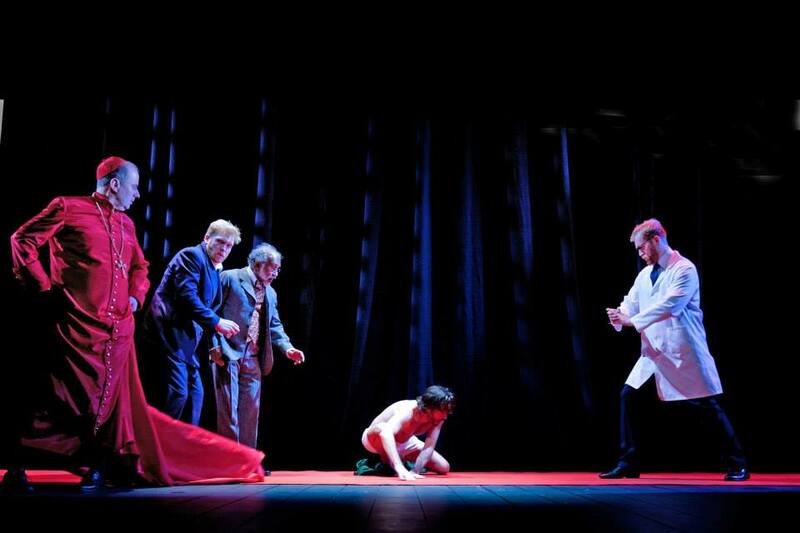 Review: The Duchess of Malfi at Nottingham Playhouse – East Midlands Theatre. 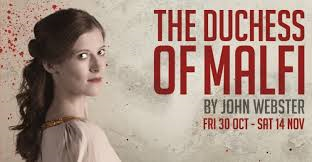 Directed in fine and bloody style by Fiona Buffini, the Nottingham Playhouse production of John Webster’s Jacobean tragedy The Duchess of Malfi – mostly modern dress – is performed with guts and immediacy. The poetic language might take one’s ears a few minutes to get accustomed to but the text of Webster’s masterpiece is well served by this company whose delivery is clear and precise and has a heightened naturalness that befits the unfolding and dynamic drama well. The set (designer Neil Murray) pre-performance seems only to be a giant and ornate door sitting centre stage. One might think budget cuts have struck hard at Nottingham Playhouse in what could be a sparsely dressed production. Let’s hope the acting is good! However, as the lights go down darkness suddenly hits the stage with a visual thump. The drama is on! Stirring music swells (Jon Nicholls) and down swoops a stunning chandelier and elegant curtains to frame the theatrical space. Already the stage is full of ardent activity. Through the first half of the play several Italian venues are suggested through props and impressive lighting (Mark Jonathan) and various atmospheres are enhanced by composer Jon Nicholls’ haunting music. The settings in the second half take on a more mysterious nature with ghostly drapes, imaginative lighting effects and moments of clinically cruel starkness. Blood red is a regular visual anthem. Webster’s The Duchess of Malfi brings in a searing array of themes – forbidden love – murder – incestuous lust – romance – hope – forgiveness – bravery and insanity. All daily grist and gory inspiration to the theatrical mill of a well above average Jacobean playwright I guess. What thrilled back in Webster’s time shows no weakness in thrilling today’s audiences and despite the ear teasing style of beautiful and intelligent florid language on the stage there are many times in this production when the play and the audience achieve a wonderful synchrony. All is terrifically and terribly clear, not to mention darkly and mischievously funny at times. This reviewer will never hear the theatrical line “I withdraw.” in the same light again. 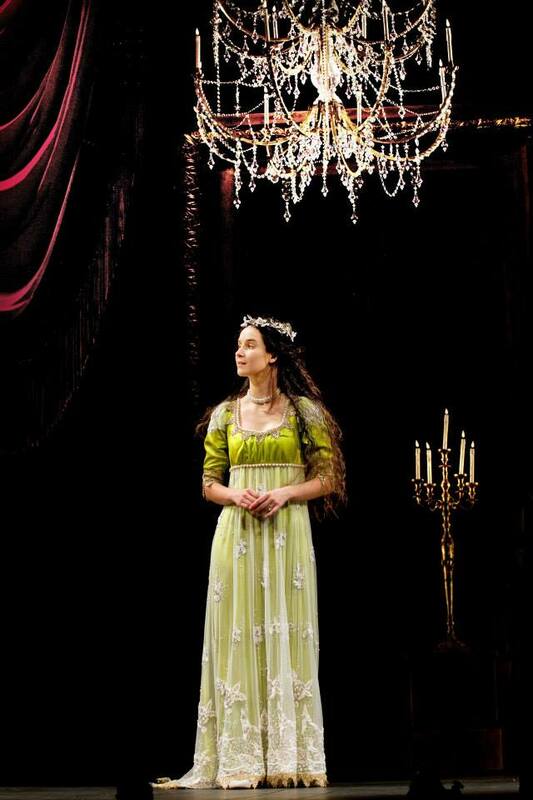 The sweet natured and gently assured central figure of the young and widowed Duchess of Malfi (Beatriz Romilly) is brought engagingly and profoundly to life by Romilly and she is very moving in her bravery during the strangulation scene. Her romance and secret marriage to Antonio (Jamie Satterthwaite) works well on stage adding a dramatic counterpoint to the brotherly (or maybe not so brotherly!) plotting of Ferdinand (Chris Jared) and The Cardinal (Patrick Brennan). Both Jared and Brennan bring a bitter Machiavellian and effervescent flavour to their sometimes darkly comical roles and prove that audiences universally love to enjoy the outrageous nature of the bad guys as long as they get their comeuppance. 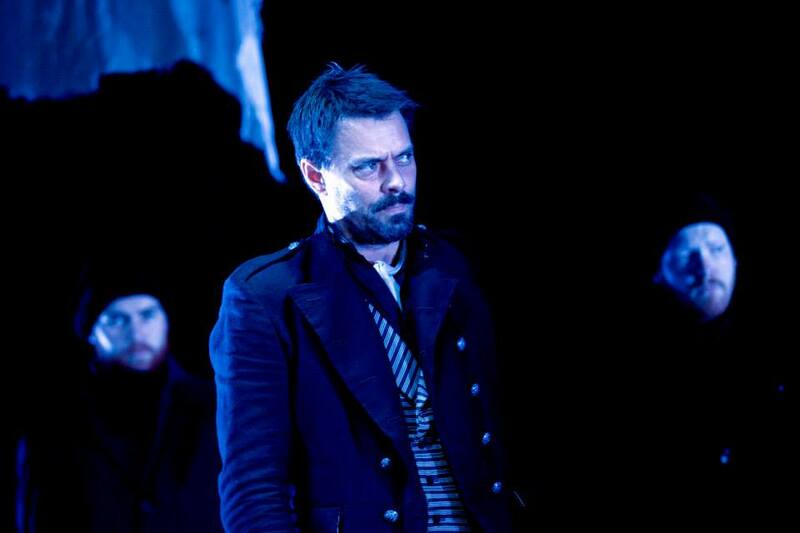 Desperate ex soldier and galley slave Bosola (Matthew Wait) who is persuaded to spy on The Duchess is convincingly played in this Iago type role. Bosola’s psychology is more deeply written however and his personality moves back and forth as he dwells on his role as spy in the increasingly murderous goings on. Wait’s performance is magnetic. In a play that has few women’s roles actress Rebecca Sarker as Julia is a sparkling diamond in a sea of murky goings on. Her two scenes with the Cardinal are superbly realised classes in perverse sexual chemistry and deadly misdeed. This reviewer wishes that John Webster had brought the character of Julia more into the story. The many fight scenes choreographed by fight director Philip D’Orlėans work well in this drama of heightened motives and the cast of thirteen including two children work very effectively and fluidly to bring across this decidedly welcome and most excellent drama of a world driven by greed and self-interest as part of the Nottingham Playhouse Conspiracy Season. 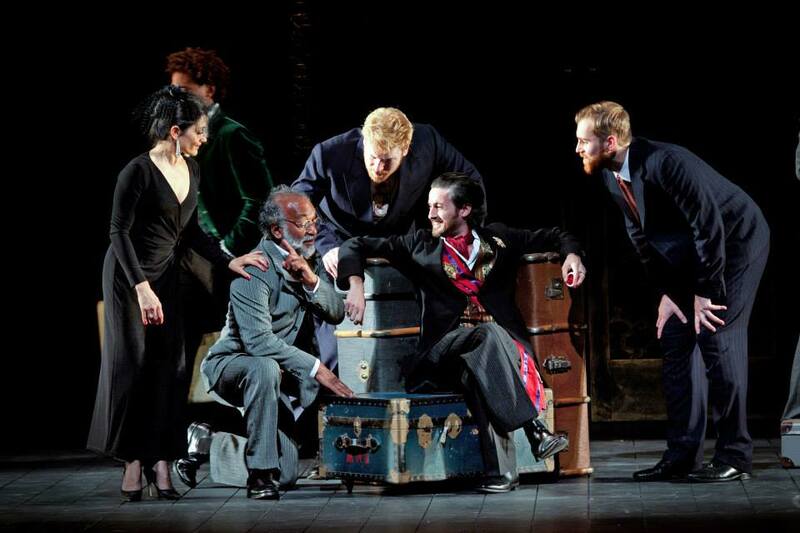 The Duchess of Malfi (Nottingham Playhouse) runs until Saturday 14th November. I went with my partner, having never seen it but studied it at sixth form. I had been thinking of finally, finally going to the theatre again and this seemed like the perfect opportunity. We both absolutely loved it – one of the highlights of our year. We go and see a lot of live music, but I’m going to have to be sure to take in a play or two every year if I can find more of this quality! It’s fantastic how the period language, so plodding and incomprehensible on the printed page, comes to life in the hands of a group of actors who know precisely what they’re saying and how to deliver it so that the audience do too.